Tuna had the most liked content! L if I know. Just being a smart a**. It's definitely a Fat Free Shad "Fingerling". Bill Dance originally endorsed for Excalibur then Bomber. Both were Pradco brands. From what an "expert' told me Excalibur lures was merged into the Heddon line a few years back. Bomber produced many of these "specials" for big box sporting goods stores some even packaged in Excalibur packaging. The "specials" were patterns that didn't make the cut in their main product line. The Excaliburs actually had better paint jobs. 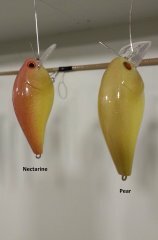 The plastic crankbait blank marketed by either name is exactly the same! Below is a 2009 1/4 oz 2.25" Excalibur Fat Free BD5F w/#6 trebles. So those guys will be told "get the red fine line sharpie out and do some similar bleed marks and gill plates on your other Fat Frees." Hey Salty's. I guess I need to know a few more anglers. Could only afford this, but working on an upgrade. Yup, looks like a BD5F. Blanks available? Want me to duplicate this if possible. Bomber Fat Free Shad 8-10 round lip. Guess a few years back Gander had these on closeout. They told me it's the only consistent fish catcher in Iowa. Don't have a model #. Any unpainted bodies resemble this crank? I told them if I can't, just get a red fine line sharpie and go to work. One guy asked what's that? Hmmm? I showed them a 1.5DD, that body too thick. Cadman, I'm not aware of any indexing between the drive and pinion gears of a Stradic. Is it when the reel is under load or all the time? I know the line guide bearings can be a problem (noisy). Been a while since I took one apart, do they have the crappy black friction rings? If so, I always replace with the blue silicone rings. Has to be in the assembly process right? We've all been there. Here's how I would troubleshoot: First Google "Shimano Stradic Gen 1 rubbing". If you get nowhere doing this I would: Rotate the crank until you detect the rub, pull the side cover, mark drive gear position, remove drive gear and inspect. Check for an index marks. Check for play between main shaft and pinion. I repaired one a guy bought for a "good price" on eBay. It had a slightly bent main shaft. Can't see this as your issue though. Check to make sure you have the correct allen screw going into worm drive. Make sure you have the correct shims on the sides of the crank assembly. For everyone else, non-worm drive spool oscillating Shimanos you have to use the index (triangle) marks to align oscillation gears. Big A hits a BINGO! I must add this, I recommend servicing any new spinning or baitcast reel you buy! Most sub-$150 reels come with greased bearings instead of a proper lube and with over or under greased gear assemblies. Manufacturers must use an injection process for these reels. Over greasing is a hack to make the reel feel smooth. A couple years ago I serviced 11 Kastking "Speed Demon" reels and found all had drag springs improperly positioned which allowed hardly any range of drag adjustment. I informed the US Kastking office in New York and the manufacturer in China. Both gave lip service but have not corrected the issue. I just cleaned two a week ago with the same issue. To alert other users I did posts on a couple popular bass fishing forums. Many members replied finding the same issue. Sorry about the lengthy post but need to get this out there too! Don't think higher bearing count makes for a better performing reel. I have found up to six bearings in the handle. I think there is a youtube video about this subject. The guy is right on! Here's my baitcast servicing routine; If not provided with reel, look up and save schematics. Customer receives a copy with finished reel. Disassemble reel, remove large amounts of grease and inspect for worn parts. Call customer with inspection concerns, recommend upgrades and order parts. Small metal parts go into an ultrasonic bath using warm water and couple drops of dawn. (a little vinegar if reel exposed to salt water) Once excess grease is removed, side plates and greased parts go into a clear plastic peanut butter jar containing some Dawn and hot to the touch water. Soak for a few minutes, then agitate with toothbrush until clean. I usually having several reels being done at the same time in separate jars. Hit parts carefully with compressed air or blow dryer to aid drying. Handles, due to many having bearings either get taken apart or cleaned as best I can. If customer desires, perform super tune polishing using a light blue jeweler's rouge with dremel felt pads. Lubricate during reassembly, light coat of Abu Garcia Reel Lube on bearing races, one small drop of diluted TSI 321 for bearings using syringe type nozzle and a light coating (just so you can see your fingerprint) of Cal's purple drag grease on drag washers. I also apply this light coating to carbon washers because it provides a better range of adjustability (for the guys who don't always crank them down tight) and a tooth-high application of AG lube on main gear. I use a small amount of AG lube on the worm gear too. Many say a drop of oil is better since it attracts less dust/dirt although I have not been told of any issues when I ask customers. I keep track of jobs on an excel spreadsheet and with codes for each task to provide a good servicing snapshot. Here's something to remember though, my servicing method makes for an easy rotating assembly. Some may not prefer the feel. On that occasion I add a thicker grease to the main gear. Make it feel more like factory I guess. I've done reel servicing for a few winters now and make several thousand casts with a baitcaster each summer. Stainless Abec5 bearings are as far as I go when recommending upgrades. Always lube with a small drop of TSI 321 cut 50/50 with isopropyl alcohol. The alky evaporates leaving a thin synthetic film. Polish the brake surfaces and spool shaft bearing surfaces ("Super Tune"). Ceramics are much noisier and may give only the most experienced caster 5 more yards on a bomb cast. Picture a nice quiet morning and you're the guy making noise. My advice is spool up with no heavier line than is needed and practice casting with only your thumb. This will get you accuracy and distance. Also, when putting your baitcasters away for the winter, back off the drag pressure. For spinning reels I always replace factory plastic bushings with SS bearings, Abec3 good enough. I would scrape an old thinner rod and if doable, insert it inside the broken rod blank. Make sure the two blanks have at least 3" overlap. Might have to mess with getting the tapers right. Basically a spigot ferrule. Wrap over area for additional support. There, a repurposed rod. Have done this a few times with broken rods people left on shorelines, even made one into a 7'6" telescopic I throw wp's with. Tried many types of blank coatings. PermaGloss, IMO, by far the thinnest and most durable.